Sorry about the dog nose, but that fox cub is cute! 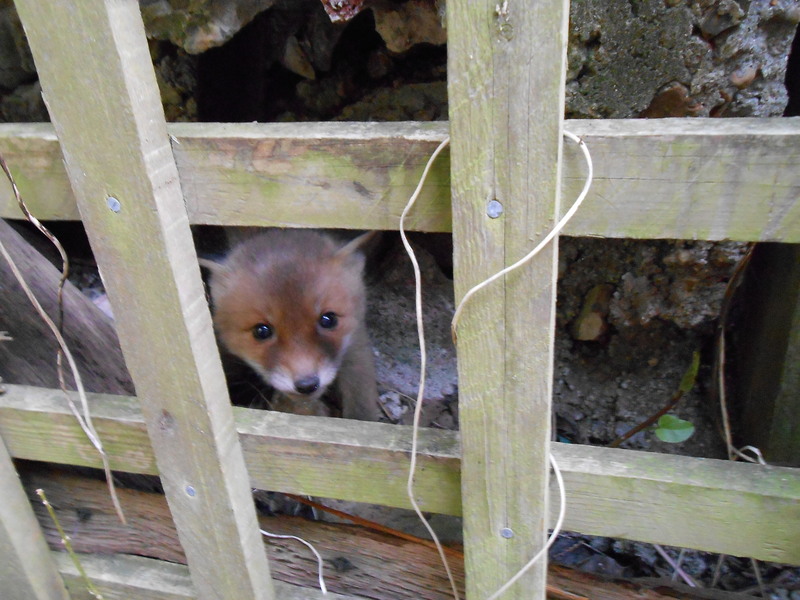 For the last few years, a vixen has deposited a cub between the fences on our boundary, perceiving it as a safe place to leave one of her brood, whilst she’s in the process of relocating her family.She usually collects the deposited cub between 12 and 24 hours later. This is the first year that my dog has ended up bitten (albeit not badly). Usually there’s just an exchange of cub yips and Labrador barks. Obviously, this year’s cub was pluckier and luckier than usual. I hate to think what would happen to child who put its fingers through the fence, thinking that cute equals docile. I agree, fox cubs are incredibly pretty. If I were to ever write poetry, which I won’t, I would write haikus. They appeal to me for some reason. When I first read the title I thought it said “Fox Club.” I couldn’t figure out what a fox club was. It might be too early in the morning for me to read hubs. LOL Happy Monday, Sarah! My dog would go bonkers, should the foxes think about forming a “club” in her garden. Mr Fox loves adopting a nonchalant pose in the neighbouring garden by a small gap in the fence just out of reach of my dog. I bet he would love to found a fox club and hold the meeting by that gap. He is beautiful, but I hope his mother collects him soon and that doggy’s nose quickly heals. Yes, his mother did collect him and my doggy’s nose is fine, thank you 🙂 That cub was so tiny and courageous. He wasn’t frightened of me when I spoke to him, but then I didn’t attempt to stick my nose his side of the fence! It’s hard to win, Sarah, but the haiku is a winning one. Dearest Sherri, you’re not the only one who doesn’t keep up with post reading and has to do sudden catch ups. If only there were more hours in the day; either that, or it was possible to be more efficient with our time! Thanks for all your “likes” and for leaving a comment over at Rochelle’s blog. That cub was the prettiest thing close up. I was about 18 inches from it and it didn’t seem to mind me at all. My dog is very gentle, but thinks it her duty to guard her territory. She usually shows little other than a passing interest in foxes seen outside of her garden. I’m guessing you’re going to blog about foxes!